Morah Nehamah Liebowitz, the late Torah commentator, is said to have hated the concept of Mother’s Day; she thought it crazy that we would take one day to be nice to mothers— according to her, every day should be a celebration of mothers! When thinking about Tu B’Shevat, what has become Judaism’s annual version of Earth Day, I sometimes feel the same as Morah Liebowitz. Ilanot Chalutzim planting in our greenhouse. Tu B’Shevat began as a fringe Kabalistic tradition celebrated by mystics. In the past few decades, through a number of Jewish communal initiatives, it has become a mainstream holiday; a time for all of us to take meaningful actions to incorporate Jewish environmental values into our lives. And let’s be clear, it’s a good thing that the Jewish community has days like Tu B’Shevat where we can think about how our actions affect the environment. But, to echo Morah Liebowitz, one day is not enough! For us to fully commit ourselves to changing the way in which we interact with the natural world, we are going to need more than a day to make these changes. We are going to need to see how our lives, most of which are lived in urban environments, affect the natural world around us. 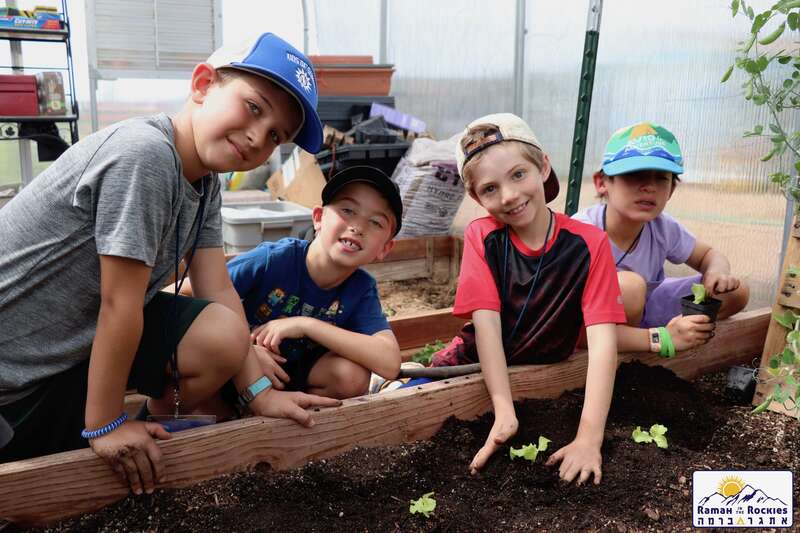 At Ramah in the Rockies, our community comes together each summer to spend ten weeks living consciously with nature, although our campers rotate in and out every two to four weeks. Yes, we use many of the modern conveniences found in our urban lives – electricity, fossil fuels, and satellite phones. Yet, at the same time, we go out of our way to be intentional about our relationship with the natural world. Our campers live in bunks with no power. We use a method of fermenting garbage, called Bokashi, for most food scraps that are composted for our garden. We pre-heat our shower water using the sun’s rays. 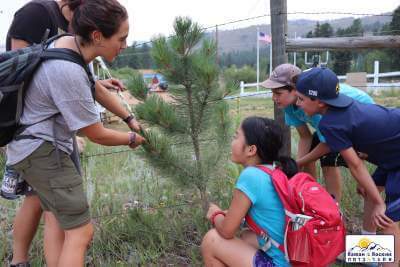 Most importantly, each camper spends time during camp experiencing nature up close. There is no better way to appreciate the great outdoors, than to surround oneself with the phenomena of our living world. On a multi-day backpacking trip, campers view incredible vistas, drink in the warmth of sun on their faces, and encounter the thirty-degree temperature swings common in the Rockies in July. We often see our younger campers playing with rocks, sticks, and dirt, and building forts using fallen branches. Ponderosa pine trees smell like butterscotch! An activity I love to lead is part of our morning t’fillah, where we take ten minutes for campers to stop, explore a single tree, and its surrounding area. I ask the campers to hug, smell, and stare at the tree. I ask them to reach down to the ground and grab a handful of dirt, smelling, feeling, and sometimes even tasting it. We do this as part of our morning prayers, because it helps raise our awareness of just how alive the world around us is, and how magnificent and complicated nature can be. We do this as part of our t’fillot because, as a Jewish educator, I believe our Torah has a role in answering many of the issues facing our people and society. I see Ramah in the Rockies serving as a lab for young people to develop a Jewish love and appreciation for the natural world around us, creating a society living in concert with nature and helping it continue sustaining human life for the next ten thousand years – answering an acute challenge of our time. Having our campers and staff translate their summer experiences into lifetime engagements with others working to protect, grow, and sustain our living world, that is our goal.